What happened? Wednesday is was in the 60s. By Friday afternoon, we had 6 inches of snow on the ground and more coming. This morning it was -1 degrees. Snow has stopped and it is 24 degrees. The prediction is for low 30s tomorrow and Monday. By Tuesday, we might see mid 30s and even a little higher as we move into the weekend. Needless to say, with this cold snap everywhere, generation has been non-stop. They had the equivalent of a full three units running this morning (using four units). We are seeing a low three right now with the tailwater level in the 707 range. 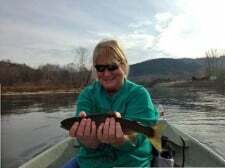 Before frigid weather, RB and Teresa spent half a day Tuesday on the river with Carolyn. RB has been fly fishing for a while, but Teresa was (emphasis on was) pretty new to the sport. Good, fun day for these two. With three units going, we had the opportunity to fish a few different places, including behind the long island at the Pointe. Good day on the big ruby with a lightning bug dropper. Down the high bank from Lookout Island, we dropped the white grub from the big ruby and continued hooking fish. Wednesday, Stan had Don and John, from Illinois on the water for half a day. Good day for these two, as it usually is, on the big ruby, a lightning bug dropper or a black zebra with a gold head dropper. 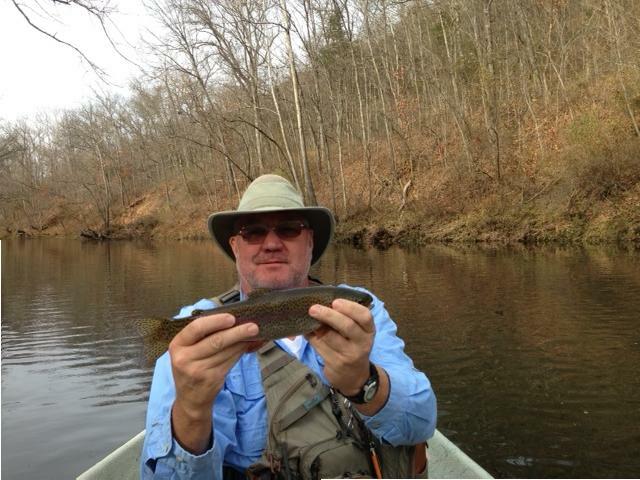 This entry was posted on Saturday, December 7th, 2013 at 4:06 pm	and is filed under Fishing Reports. You can follow any responses to this entry through the RSS 2.0 feed. You can leave a response, or trackback from your own site.